The Wandering Arborist: The Band, a spray alternative. The Band, a spray alternative. When controlling pests on trees and shrubs we often think of spraying some kind of chemical product, and while this is often our only course of action, for some pests there are alternatives. Many pests can be physically removed. Webworms and tent caterpillar nests can be pruned out or destroyed. White peach/prunicolia scale can be scrubbed off the stems of small cherry laurels and lilacs. 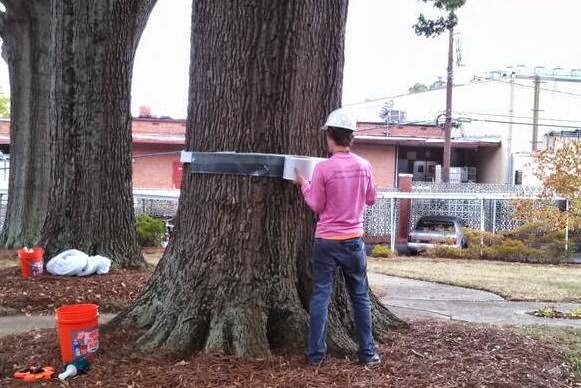 Another non-chemical method for preventing pest injury to trees is creating a physical barrier. This is most effective against certain species of lepidoptera that climb from the ground in to the canopies of trees to feed or lay eggs. In the Charlotte, NC metro area there's an unprecedentedly large population of fall cankerworms (Alsophila pometaria). There are many theories as to why cankerworm numbers are so large, but no doubt part of the problem lies within the overwhelming number of mature willow oaks (Quecus phellos) lining streets and gracing private yards. Cankerworm adults emerge from the ground after the 1st series of cold nights (at or below freezing) in the late fall/early winter. The adult female cankerworm doesn't have wings, and is forced to climb up the trunk into the canopy of a tree to mate and lay eggs. Each female can lay between 100-200 eggs. In spring, just as leaves are approaching full expansion, the little inching cankerworms emerge from their eggs and feed on the tender young foliage. These cankerworms are present in such damaging numbers that the city of Charlotte, and most of her residents, habitually affix bands covered or lined with sticky stuff to trees throughout the fall. This way cankerworms are controlled safely and economically. Heartwood Tree Service Arborist affixing 'Bug Barrier' to the trunk of a willow oak. What big thorns you have.